At the port downtown, you can hop on the Bear Bus, a free shuttle to the Fortress of the Bear. However, the bus is out of commission on occasion. In that case, you can expect a taxi to run you about $20 each way (not too bad split among a group). Fortress of the Bear is a sort of wildlife preserve. They take in both injured bears and bears that have gotten too used to people to still be living safely near them. 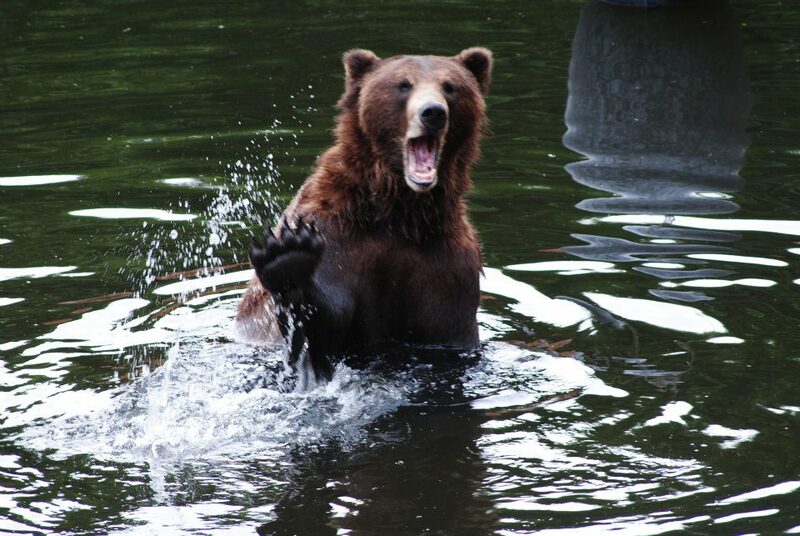 The sanctuary’s stated goal is to, “…work with the Alaska Department of Fish & Game to someday release rehabbed bears back into the wild.” The Fortress features knowledgeable guides who love answering questions about the bears, and – quite honestly – they are flipping adorable. Besides checking out the bears, you should also check out the small petting zoo filled with animals like ducks, goats, and sheep. Ask the Bear Bus shuttle driver if he’ll drop you off at the Alaska Raptor Center on your way back into town. You won’t be sorry. The Raptor Center is another spot like the Fortress, except here they rehabilitate birds… specifically raptors. You can learn a lot about the different types of raptors and how they are taken care of at the Center during some of the several presentations that they offer. Following the presentations, wander the grounds and check out all the birds in their care. These include several bald eagles along with many other magnificent specimens. Welcome to Stika’s only brewery – the Baranof Island Brewing Company. To get here, catch a cab from the Raptor Center and ask them to take you there. I definitely recommend trying the 7-Beer sampler. Spruce Beer and Halibut Point Hefeweisen were two of my favorites. Round out your beer sampling with a sandwich from their kitchen. Their menu isn’t huge, but it’s also more reasonably priced than anything you’ll find downtown. Additionally, if you feel like the Fortress of the Bear and Raptor Center really aren’t your thing (although they should be, the Fortress is one of my favorite spots in Alaska), there is a free shuttle to the brewery from downtown near the dock. Just ask around and one of the tour operators that are always around down there should be able to point it out to you. Catch the free shuttle back to the port and take a stroll around downtown Sitka, Alaska. Check out the little park right next to the dock with the cement whale tail. The Russian Orthodox Church, St. Michael’s Cathedral, is certainly worth stopping in. It’s a lovely little Alaskan cathedral with a lot of artifacts from the original structure, which burnt down in 1966. Also be sure to pick up a bar (or six) of Sitka’s own Theobroma chocolate. Honestly, they’re all pretty good, but I’m partial to the Milk Toffee Crunch. If you need a nice cup of java or are looking for some free Internet (with the purchase of that java), punch Highliner Coffee Company into your Google Maps. It’s about a five-minute walk from the port, right behind the Subway. If you’re planning to spend more than one day in Sitka or want to take a day long organized tour, I would recommend any of the kayaking tours. My personal favorite was with the Alaska Travel Adventures company. It’s a really different way to get up close and personal with nature and you will be hard pressed to find a more gorgeous spot to kayak. So, if you are traveling to America’s “Last Frontier,” be sure to check out Sitka. In a land full of unique places, Sitaka is certainly one of the most interesting places to visit in Alaska. You have a little misinformation about Fortress of the Bear. They are a great facility dedicated to the rescue of orphaned bears, but they DO NOT re-release them into the wild. That is not done anywhere in the state of Alaska. They do, however, find homes in zoos for these orphans so that they do not have to be destroyed. Hey Fred! Thanks for stopping by and for catching our mistake. While the Fortress of the Bear does not currently re-release bears back into the wild, their stated goal is to someday be able to do this. We have edited the post to reflect this. Thanks again for dropping by and for taking the time to comment! Oh my gosh, Fred, you’re right. I’m so sorry. I must’ve misheard since I based that information off of one of the tour guides at the Fortress. I definitely do remember them talking about rehabilitating them enough to go live in zoos though. Thanks so much for this information. You just made planning our day in Sitka a breeze! Thanks for including the key information about how to get from place to place. It looks interesting with the bonus points for being inexpensive, and what money we spend will be to support excellent organizations. After the expensive excursions in Juneau this will be a great way to balance the books.